Perhaps my wires are crossed. I keep looking at this picture trying to figure it out. Is it an anchor and a shark? Where does the fin being and the metal end? There is no shark. 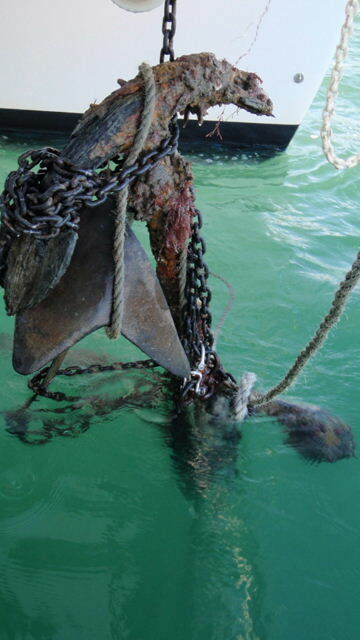 It's a picture of two anchors lashed together with rope and chain. One is visible and the other is partially submerged in the water. I thought that this was a good place to begin, this photo that is. I have been reading a lot of poetry. I am half way through Money for Sunsets By Elizabeth J. Colen. I have read and reread Mark Wunderlich's book The Anchorage. And then there are the four metaphysical poets I am reading: Herbert, Marvell, Donne and Vaughan. I then shifted to an intensive read of Mark Wunderlich's The Anchorage, which won the 1999 Lambda Literary Award for poetry. His book has been our for long enough and reviewed extensively. I feel that other people have said what I have to say (and more thoroughly than I could at the moment) about the poems therein. I do want to comment on the shift in styles between the sections of the book. The book moves from tercets to finish with dense paragraphs of prose poems. Wunderlich's flowing lines and internal and off rhymes are a contrast to Colen's book. What I took away from The Anchorage was a watery image of winter light, sheets hanging on clothes lines and empty beds. His book was an extended meditation on the body and longing. I almost feel as if Wunderlich was an ideal segue into the metaphysical poets who are very much concerned about questions of the body, the soul, longing and desire. The language and style of verse aside, I feel that there is something very modern about the metaphysical poets, especially Donne. I think that this is one reason that he continues to be popular; Donne remains witty four hundred years after his death. What I love the most about the poets of 1600s England is the sheer music of their lines. It is a relief to hear some apologetically rhymed and metered verse after the barrage of free verse in modern poetry. The antique language and stilted phrases can come off as corny, but when I read the lines aloud and repeat them my tongue begins to leap from line to line. Although some of the references in the metaphysical poems are obscure (and I am the sort to look them up) I find that their logic is refreshing. Poetry as argument. Poetry as a questioning on philosophical matters. Poetry as praise, satire and scorn. There is something delightfully straight forward about these poets that is missing in most modern poems. Don't get me wrong, I don't think that poetry should have to have a clear arc. Half of poetry is that it means more than it says... Sometimes the sound is the sense of a poem. What I am saying is that there is a great obfuscation of meaning in modern poetry that is not found in earlier verse. I am much less likely to memorize a Rae Armantrout poem than one by Andrew Marvell. The rhetorical moves and the music in Marvell are clear. In my head these poems and prose poems are twisting together into a knot of sound and form. It is exciting even if the results remain hidden beneath the water. I want to leave you with the opening stanza of John Donne's poem "Song" so that it can sing in your head for the rest of the day. A fitter love for me;..."
The Car That Brought You Here Still Runs is a tour of the Pacific Northwest through the eyes of Richard Hugo’s poems. If you don’t know who Richard Hugo is, you are missing out. Born in White Center, Washington and buried in Missoula, Montana, Hugo’s poetry encompasses the landscape and places of the northwest. Although Hugo passed away in 1982, his work continues to inspire and instruct modern writers. 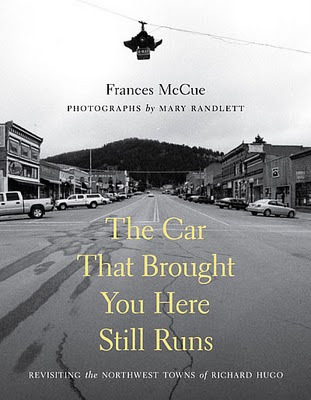 Frances McCue, a true devotee of Hugo follows a winding course through Washington, Idaho and Montana using his poetry and life as a road map. McCue’s book is part travelogue, part literary history, mixed with memoir and dashed with speculation. There is no single genre that this book falls easily into. Hugo fans, poetry lovers and northwest travelers will all find something between its covers. Hugo’s poems are a lesson in alienation and longing to fit in. McCue travels to the towns that surface in the poems: Phillipsburg, Wallace, Dixon, Butte, White Center and others with Hugo’s lens of words. She also visits each place with her own inquisitive gaze. This double vision creates a tension of perception. It examines the truth in both the imagination and physical facts. McCue also adds to her essays the voices of Hugo’s friends, critics and colleagues to give a broader vision of the author. She also talks to many people who live in these towns who have never heard of Hugo. A wonderful addition to McCue’s exhaustive knowledge of Hugo and his work was the photography of Mary Randlett. She has been photography the Pacific Northwest and its people for nearly over 55 years. Randlett’s black and white photographs of the towns and landscapes in Hugo’s work add a stunning complexity to The Car That Brought You Here Still Runs. Even her most direct shots evoke a charged mood. Randlett’s photos lend McCue’s words and Hugo’s poems an almost premonitory quality. This is a book for people who love pilgrimage. Twenty-four of Hugo’s best poems of place are sandwiched in between Randlett’s photographs and McCue’s tightly written, deceptively broad essays. Each chapter in the book is divided by town, although you cannot always travel from one place to the next in a direct route, nor chronologically. This book is a work of love to Hugo and the towns of the Pacific Northwest and one, which I loved to read. This summer has been very good to me. You can find my work in three literary journals. You can even see two of my newest poems online, for free! published two of my newest poems in their first issue. You can see my poems from the "Carbonite Dream Series" on pages 36-37. Gertrude Press out of Portland, OR publishes the literary journal Gertrude: A Journal of Voice & Vision. They've been publishing LGBTQ artists and writers since 1999. Gertrude Press is one of oldest continously-published literary journals for the queer community worldwide. I have a poem forthcoming in issue Number 15. And last but not least, you can see my poem "Cold Mountain Blues" in the 2010 issue of Front Range: A Review of Literature and Art Volume 5 Issue 1. This journal publishes out of Great Falls, MT. I was happy to appear in a home-state journal. My poem is on page 38. Last night I drove from my new home in Moscow, Idaho to a small town called Uniontown, WA. Early in the last century, Uniontown was still booming with river transport along the Snake River and the pre-industrialization of farming. Today, Uniontown is still at farming community, but its population is down to about 1200 souls. The Dahmen Barn was on its way out too. The old structure was slated to be torn down. Through many members of the community, the barn was transformed from a sagging pile of lumber into a community art space. Today it is filled with art studios, workshop space and a gift shop. This is where I would get to experience an evening of cowboy poetry. The event was put on by the Palouse Country Cowboy Poets. This group of farmers, ranchers, vets, teachers and community members has been meeting for the past 40 years or more. The organization currently boasts 35 regular members, some who have been with it for as many years. It was a packed event with 40-50 people in attendance. What got me excited was the $7 admission. I can't remember the last poetry reading I attended where the audience members had paid to listen to a poet recite work. Eric Larson emceed the event and even got in a poem of his own toward the end. Cowboy poetry is a form of the ballad. The first ballads appeared in Europe during the 15th century. They were narrative or told popular stories of the time. Think of ballads as courtly pop radio songs. Ballads use a regular rhythm and simple ABAB rhyme scheme. Some better known ballads are "The Man From Snowy River" from Australia and The Rime of The Ancient Mariner. Howard Norskog read last night. Speaking to one of the other poets during the intermission, I found out that Mr. Norskog is well known in the cowboy poetry world. He is a three state champion and the author of four books and four recordings. Here, he is reciting his ballad "The Lost River" accompanied by Maxine on her accordion. The evening also featured a few songs. It was a great experience and one that I hope to repeat. There are things to look forward to in rural Idaho.